The Metropolitan Fire Brigade’s (MFB) latest Victorian Emergency Management Training Centre contains 280 tonnes of steel, with 88% of all buildings, including all handrails containing Hot Dip Galvanized (HDG) components completed by Kingfield Galvanizing. 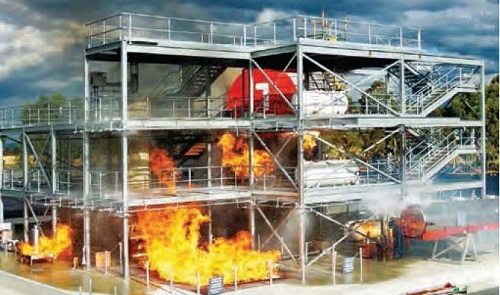 The centre provides a facility for fire fighters and all other Victorian emergency management to train together in realistic emergency situations and contains modern training facilities and infrastructure. What makes the design so unique? The centre has areas that simulate the situations emergency services personnel typically face including: fires at a shop front, service station or petrochemical facility, searching collapsed buildings, carrying out road rescues and an emergency in a railway tunnel. Within the facility is a large seven-storey prop complete with car park offering emergency training for high-angle and aerial rescue. Internally the building is fitted out with various fires and smoke spread situations that a fire fighter would encounter in a city multistorey building. The petrochemical plant was nearly entirely constructed from HDG steel. This is the first project of this sort to use HDG steel to such an extent. The durability provided by hot dip galvanized (HDG) steel is proving to withstand exposure to fire, water and chemical residue that is all in a day’s work at the facility. This job is believed to be the first project of this sort to use HDG steel to such an extent. Odd shaped handrails were specified which required precision handling to ensure venting, minimise draining and distortion issues as well as enhance aesthetics. Being involved from the design stage with the architect and fabricator, Kingfield Galvanizing ensured all members designed a solution with HDG in mind and the facility met MFB requirements. A good working relationship was also maintained from early in the project with the engineers, transport companies and riggers. The use of HDG steel at this important facility ensures little maintenance is required by facility managers after each training session and during the life of the product. This project was the winner of the Australian Institute of Project Management (AIPM) 2014 Project of the Year and 2014 Construction / Engineering project over $100 million. It was also a GAA 2014 Sorel Award finalist. The project supports Kingfield Galvanizing’s recent win at the 2017 Premier’s Sustainability Awards for our low emissions, sustainable and highly automated hot dip galvanizing plant.